DIAMOND GEEZER . . . Barry McNamee netted his ninth goal of the season after just 30 seconds of Sunday's clash with Limerick at Maginn Park. THE TIMING of Derry City’s recent run of victories couldn’t have been much better as it’s coincided with the misfortune of their rivals for the third European spot. Kenny Shiels’ troops extended their mini-run of wins to THREE as they emphatically cast aside the tame challenge of a Limerick side clearly in transition under the stewardship of their third manager this season! The 3-0 win extended their lead over Shamrock Rovers to FIVE points while Bray Wanderers, who were in pole position for European qualification after the midseason break, appear to be in crisis and in free-fall. Four defeats in succession leaves the Co. Wicklow men SEVEN points behind City and, given their well documented off-field problems, they can be considered third in a three horse race for third. Rovers, meanwhile, despite a superb 1-0 win over champions Dundalk in recent weeks, suffered a huge setback when losing the Dublin derby to Bohemians last Friday night. The ‘Hoops’ have a game in hand over City but should they lose Friday night’s massive clash in Tallaght Stadium they’ll find themselves with a daunting EIGHT points deficit to climb with the fixture list quickly diminishing. They could beat us and win their game in hand and then they’re ahead of us in a matter of days. A win for Derry would ensure the finish line is in sight and with momentum and confidence growing and with new signings in place, there’s a real feel-good factor surrounding the club. Although both Shiels and scorer of the controversial second goal of the night, Lukas Schubert, were more cautious than that and quick to warn that the potential eight point gap over Rovers could just as quickly become two. “If you step off the gas it can easily go the other way and that’s football. It could also be two points just as easily,” said Schubert. So there’s so much riding on Friday’s result at the south Dublin venue. Sunday afternoon fixtures at Maginn Park allow the ‘Candy Stripes’ the benefit of knowing how their opponents have fared but they still need to produce the goods and they did that impressively against the ‘Super Blues’ who were anything but super. After the opening nine minutes of this game the match was all but over as a slick, in-form City side passed their opponents off the pitch with some stylish passages of play and emphatic finishing. 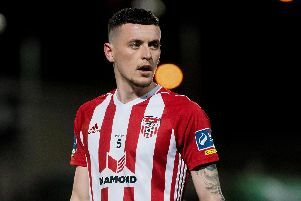 Barry McNamee pounced after 30 seconds as he pressed high, intercepted a poor backpass from new signing, Joe Crowe and nipped in front of Limerick keeper, Brendan Clarke before slotting in his ninth goal of the campaign. It was a dream start for the home side and they doubled their advantage on nine minutes when Conor McDermott pulled the ball back to Rory Patterson and his low strike from the edge of the box found the corner of the net via the foot of Schubert. It’s certainly one for the ‘Dubious Goals Panel’ to sort out but even Schubert is hoping the league hand it to Patterson who has to be applauded for the way in which he’s come back from two serious injuries this season to play such a big role in City’s recent revival. “Rory deserved it more,” said the Austrian. “He shot and I tried to get out of the way and it came off me and went in,” he smiled. Patterson should’ve found the target when Schubert and McDermott linked up brilliantly on the right flank before the Austrian midfielder picked out the striker who blasted over the crossbar from 12 yards on 67 minutes. City were quite content to slow the tempo of the game as Limerick offered very little in terms of an attacking threat. Only on one instance did the home support hold their collective breath anxiously when Darren Cole challenged Chiedozie Ogbene inside the penalty area but the referee, who was better placed than most, saw nothing wrong with the tackle. And then Ben Doherty came off the bench and within four minutes sealed the win when Dean Clarke scuffed his clearance from Aaron McEneff’s cross and the son of ex-City skipper, Eamon, reacted quickest and volleyed into the net for his first senior goal. DERRY CITY: G. Doherty; C. McDermott, D. Cole, A. Barry, Dean Jarvis, A. McEneff, N. Low (R. Holden 87), L. Schubert (N. Boyle 80), B. McNamee, R. Curtis (B. Doherty 80), R. Patterson; Subs Not Used - E. Grimes, H. Monaghan, J. Daniels, E. Toal. LIMERICK: B. Clarke; D. Clarke, T. Whitehead, J. Crowe, D. O’Connor; C. Ogbene, S. Duggan, L. J-Lynch, H. Cameron (B. Hery 57); S. Kenny (C. Walsh O’Loughlin 90); R. Tosi (J. O’Flynn 57); Subs Not Used - F. Hall, S. Tracy, G. Coughlan, K. Brouder. Ref. - D. MacGraith (Mayo).